Taking a vacation is a great way to relax and get away from everyday responsibilities for a little while. But the constant accessibility that mobile phones provide has made it harder to avoid work emails, so you may decide to stop checking your messages for a little while. You don’t want to ruin your existing emails relationships because you won’t be responding to emails for a while, however, so it’s helpful to set a vacation response so that senders know when they can expect to hear back from you. 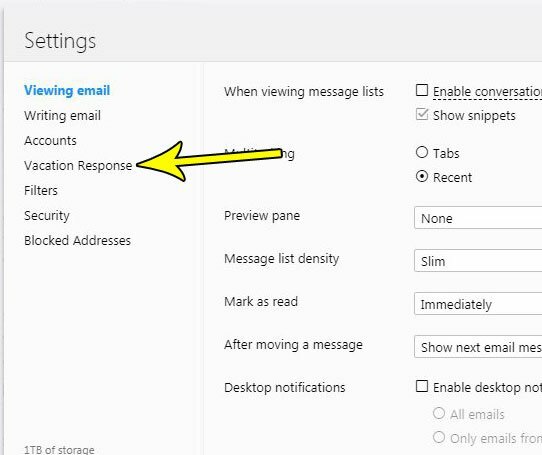 Our tutorial below will show you how to set a vacation response in Yahoo Mail so that a message is sent automatically when you receive an email during the dates that you specify for the vacation response. The steps in this article were performed in the desktop version of Google Chrome, but the same steps will work in other desktop Web browsers like Firefox or Microsoft Edge. Once you have completed this guide you will have created a vacation response that will automatically be sent to anyone that emails you between the dates that you specify. Step 1: Go to https://mail.yahoo.com and sign into the Yahoo Mail account for which you wish to set a vacation response. Step 2: Click the gear icon at the top-right of the window, then choose the Settings option. Step 3: Click the Vacation Response tab at the left side of the menu. 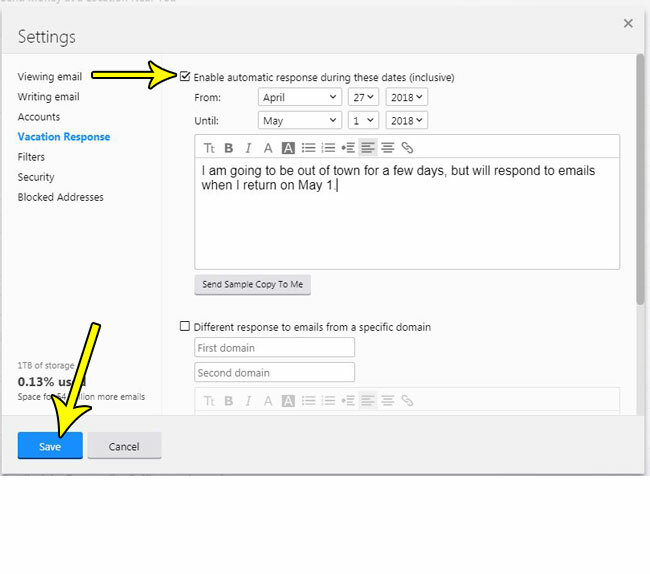 Step 4: Check the box to the left of Enable automatic response during these dates, then adjust the From and Until options to match the dates during which you wish to send the vacation response. Type the vacation response you wish to send into the the message body, then click the Save button at the bottom-left of the window. Note that if you wish to send a different vacation response to people emailing from a different domain (such as gmail.com or outlook.com), then you will need to check the Different response to emails from a specific domain and enter the domain in question. You can then type the response that you wish to send only to people emailing from that domain. Do you want to sign up for a newsletter or a mailing list, but don’t want to share your real email address? 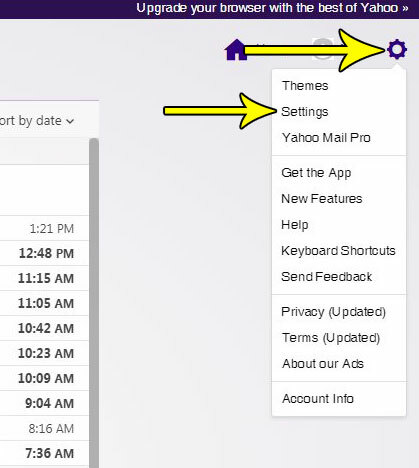 Find out how to create disposable email addresses in Yahoo Mail so that you can receive messages, but don’t risk exposing your real account address. How Big Are Amazon Prime Video Downloads on an iPhone?